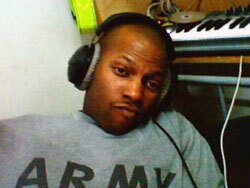 MARFA, Texas – Army Specialist and Iraq war veteran Marc Hall was incarcerated by the U.S. Army in Georgia for recording a song that expresses his anger over the Army’s stop-loss policy. Now he waits to be shipped to Iraq to face a court martial. Attorney David Gespass, a member of the National Lawyers Guild and founding member of the Military Law Task Force, has been consulting on the case and will possibly represent Hall. Gespass explained he believes the Army is handling the case this way for two reasons. Hall, who is in the Army’s 3rd Infantry Division, was placed in Liberty County Jail for the song, in which he angrily denounces the continuing policy that has barred him from exiting the military. On Dec. 12, Hall was thrown in jail by his command, on the pretext that the song he had written is considered a threat, and he is facing charges under Article 134 of the Uniform Code of Military Justice (UCMJ), which covers communication threats. “The charges are connected to song lyrics allegedly written by Spc. Hall that allege deadly threats against his chain of command and fellow Soldiers, specifically shooting them,” reads a statement released the by the Fort Stewart Public Affairs Office. Military service members do not completely give up their rights to free speech, particularly not when they are doing so artistically while off duty, as was the case with Hall. The military is claiming that he “communicated a threat” with his song. Hall mailed a copy of the song to the Pentagon after the Army unilaterally extended his contract for a second Iraq deployment. The Army’s latest decision to deploy Hall to Kuwait is an unusual twist in a case that has already attracted widespread criticism from GI rights lawyers. Once in Kuwait, Hall will be driven into Iraq to meet up with his is old unit, and placed in confinement and court martialed there. Kevin Larson of the Fort Stewart Public Affairs Office says the trial will be held in Iraq because that is where important witnesses are. “It makes sense from the standpoint of witnesses. Most of the witnesses are deployed,” he said. Jim Klimanski, a civilian military lawyer and member of the National Lawyers Guild and the Military Law Task Force, told IPS that he feels the military is overreacting to the case, and that it is simply a matter of free speech and that the Army’s actions violate Hall’s First Amendment right to free speech. Klimanski, along with underscoring the importance of the case for the First Amendment, thinks the case highlights the military’s ongoing use of stop-loss, which also contributes to how they have responded to Hall’s song. Hall’s supporters also say that it is highly unlikely that his current military lawyer will be available to deploy at a moment’s notice. At the time of this writing, Hall was awaiting his being shipped to the Middle East, which could happen any time.